Crews will be performing limited sewer rehabilitation work as part of construction activity for the extraction shaft and the tunnelling. Where: Eglinton Ave from west of Alameda Avenue to just east of Marlee Avenue. 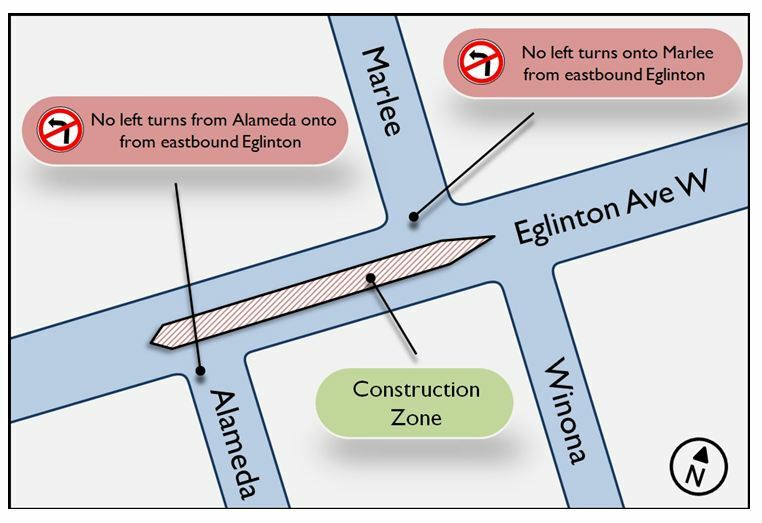 When: Single lane restrictions will involve a centre construction zone set up on Eglinton Avenue between Alameda Avenue and Marlee Avenue. The work will occur within any time from the second week of August to the end of September as the work will only proceed under dry weather conditions lasting approximately 3-5 days in length, work will occur both during the day and night. Timelines may be rescheduled or adjusted due to weather conditions and unforeseen circumstances. During this phase of work, lane restrictions wll be set up in the centre lanes of Eglinton Ave. Paid Duty Officers will be located at the intersection of Eglinton and Marlee for assistance with traffic and pedestrians. Your cooperation with the on-duty Police Officer is appreciated. Most of the work will be carried out between 7:00 a.m. and 11:00 p.m., 7 days a week. In certain situations, some late night and/or early morning works may be required to complete the work and keep construction moving. The contractor will not always work during the extended hours, but may do so at its discretion. Underground tunnelling and associated work may continue 24 hours a day, 7 days a week. Timelines may be adjusted due to weather and unforeseen circumstances.